HAPPY NEW CHURCH YEAR! Advent begins this weekend! Thank you to everyone who placed orders for at our Advent & Christmas Sale! All orders are available to be picked up this weekend at all of the Masses. We will also have some of the items available for purchase to take home with you. Thanks for your support of our Youth Ministry Programs! This weekend will be your last chance to buy a raffle ticket to win a beautiful Nativity Set! Tickets are $1 each or 6 for $5! The drawing will be held after the 10 am Mass this Sunday, December 2nd! 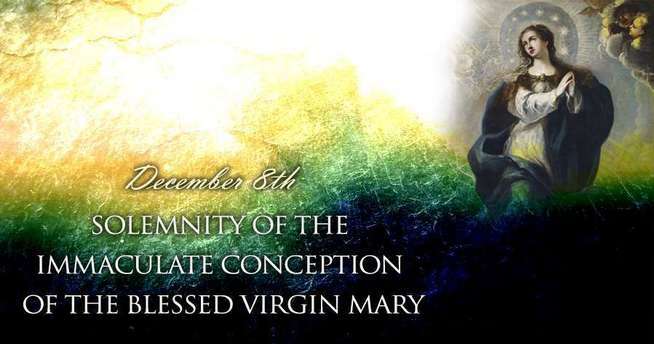 We celebrate the Feast of the Immaculate Conception of the Blessed Virgin Mary on December 8th. It is a Holy Day of Obligation. Scrip Card Sales will be available in person on Wednesdays, Dec 5 and Dec 12 in the Faith Formation Office. An order form showing all of the options went home with grades 1-7 our last night of class. All cards can be ordered up until Sunday, Dec. 9. After Dec. 9 only in stock cards will be available for purchase- there is a lot to choose from. Please consider us for your gift card shopping needs- proceeds support youth and faith formation enrichment. Please note that confession during Advent will not be available to faith formation students during class time this year. Families are invited to attend the communal reconciliation service at St. Patrick on December 13 at 7:00 pm. All 6th and 7th graders are invited to spread some Christmas cheer on Friday, December 14. We will head out in car groups to sing Christmas carols at the front doors of some of our parishioners who may otherwise have difficulty leaving their homes. If our schedule allows we may also stop off at other homes near by. We will meet at church at 5:00, practice a couple songs, head out around 5:30. We can be flexibile if someone is coming to/from other activities. We will likely end with hot chocolate and cookies. A great singing voice is absolutely, positively NOT required!!! For those who don’t like to sing, lip syncing is completely acceptable! We just want lots of happy faces delivering Christmas joy! Permission slips and more specific details will be coming. 7:00 Movie Star of Bethlehem- Scholars debate whether the Star of Bethlehem is a legend created by the early church or a miracle that marked the advent of Christ. Is it possible that the star was a real, astronomical event? (Approx. 1 hour) Movie and/or activity will be available for children not interest in watching Star of Bethlehem. Please RSVP so that we have enough food by Wednesday, December 12. Contact Kristia Loeder by email at k ristia.loeder@st-patrick-parish.com with family name, number of adults and number of children. Please mark your calendars for Monday, December 17. St. Patrick will be hosting Advent by Candlelight that evening. There will be some social time, a craft project, a talk by Fr. Greg Ihm and music in the church. Friends and family are welcome! St. Patrick Faith Formation Christmas Fair will be held on Wednesday, December 19 (a required class night) at Taylor Prairie School in Cottage Grove. This event is for the whole family! You will travel from activity to activity as a family learning about and celebrating the upcoming birth of our Savior, Jesus Christ. The evening will begin with a short performance by the Children&apos;s Choir. We will be asking the 7th grade students to help run the different stations. Note: The Christmas Fair is taking the place of the Christmas plays. We have our week for LBH 2019! Middle School Families--please check your calendars for July 14-17! We&apos;ve been assigned to go to St. Joseph in Edgerton! Registration will be coming up soon, but we will be sending all of the details to you, so keep an eye out for an email! This is open to middle schoolers and high schoolers. For more information on Love Begins Here, click here. Here&apos;s the promo video from LBH 2018 for you to watch! We are super excited to share that we reserved 13 spots for our 2019 mission trip! We are headed to Nashville July 14th-20th! We do have a couple of spots open, and once those are filled, we will start a waiting list. This mission trip is open to students who are currently in 8th grade and above. For more information about CHWC, click here and check out the promo video here! Registration is open until December 1st for Frassati Fest! It is February 1st-3rd, 2019 at the Kalahari Resort. The cost will be around $200. If your high school teen is interested in attending, please contact Kristia or Stephanie! Click here for more information on Frassati Fest! Check out this video from Frassati Fest 2018! Sponsor Certificates of Eligibility- All 8th and 9th graders. Please get these to Kristia ASAP. Confirmation Name, Saint Report AND Confirmation Information Forms are due Sunday, December 9. This is only for Grade 9. Sunday, December 16- Our First Teen Night of 2018-19. There will be dinner, a speaker and an activity. Please bring along a wrapped gift, not to exceed $10. This will be help off site (details to come). 6:30-8:00 pm. Wednesday, December 19- We will need lots of help from the 8th and 9th graders and their parents to pull off our first ever Faith Formation Christmas Fair. You will get to help set up, run activities, be jolly and clean-up. Please be sure to pencil this in! Fees can either be sent in with your child to be given to his or her catechist, or they can be dropped off in the Faith Formation office. Please contact Stephanie or Kristia with any questions about your invoice.